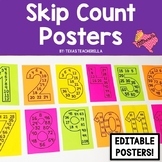 Skip counting posters for pennies, nickels, dimes, and quarters. Help your students learn how to count LIKE groups of coins. 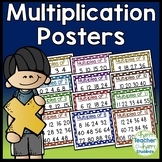 A great addidtion to your math wall or when you practice counting sets of coins. 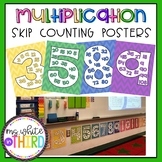 These cards are a great visual for students learning to skip count or multiply. They would be the perfect addition to your next bulletin board or maybe even supply closet door? Either way, they are sure to be a big hit in your classroom! Comes with 2 sizes of each card numbers 2-10. 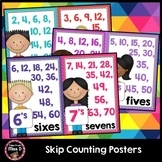 Skip counting charts: Counting by 2's, 3's, 4's, 5's, 6's, 7's 8's, 9's, 10's, 100's, 1,000's and 10,000's Print size 11x17 and you can scale to any paper size before printing. 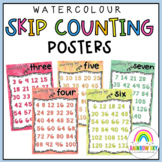 These are red/yellow bug themed skip counting posters. They include 2's (odd and even), 5's and 10's. 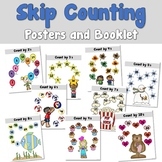 Use these primary posters to help children learn to skip count. Includes songs that helps children learn to skip count by 2s and 5s. 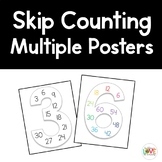 Also includes a poster to help children skip count by 10s.